1.2 2. Iron Material – Non Stick Coating Or Not? 4.1 Are Waffle Makers Any Good? 4.2 What is The Best Temperature for Belgian Waffle? 4.3 What’s the difference between Belgian waffles and regular ones? 4.4 Are flip waffle makers better? 4.5 What Are The Most Common Types Of Waffle Makers? 4.6 How To Cook Crispy Waffles? 4.7 What is The Best Belgian Waffle Recipe? 4.8 How Much Batter To Use When Cooking Waffles? Do you enjoy a mouth-watering Belgian waffle in the morning? Right? Who doesn’t? Well, why not try make it at home and surprise the whole family? Belgian waffles are not as hard to make as they sound, especially if you follow a proven recipe and you have a REALLY GOOD waffle maker at hand. Yes, you definitely need a good one, trust me on that. 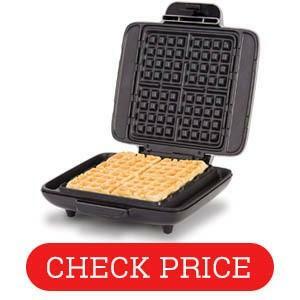 Being a chef, I started out my career in budget bakery that had the worst possible waffle iron in the world. It took some real skill and patience to get a half-decent looking Belgian waffle outta that thing. It was so annoying and, surprise-surprise, that experience what nothing compared to the budget iron my sister presented to me as a “gift” last Christmas. Total nightmare!!! I actually NEVER managed to get a decent looking or tasting waffle out of that thing and throwing it in the trash was the best decision I’ve made for my kitchen in 2018. I really think I’m not the only one here so when I had the chance to test, review and compare the 10 BEST waffle makers on the market last month to say I was excited is a massive understatement. 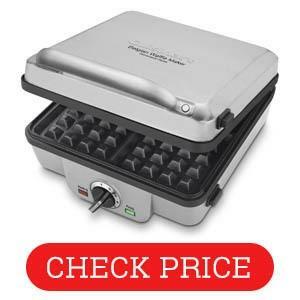 Knowing what a BAD one is massively helped me when deciding which products to test and what to avoid so stick with me and, hopefully, you’ll find your next waffle maker here and we’ll end the waffle suffering in the morning once and for all. Life is too short to have a bad waffle maker. Power is essential. The higher the power the quicker the warm-up and cooking times. You have to be careful here though – super high power doesn’t always mean perfect results. Sometimes the heating element is not distributing the heat properly and you might have uneven browning or cooking of the waffles. 2. Iron Material – Non Stick Coating Or Not? That’s the big debate, isn’t it? 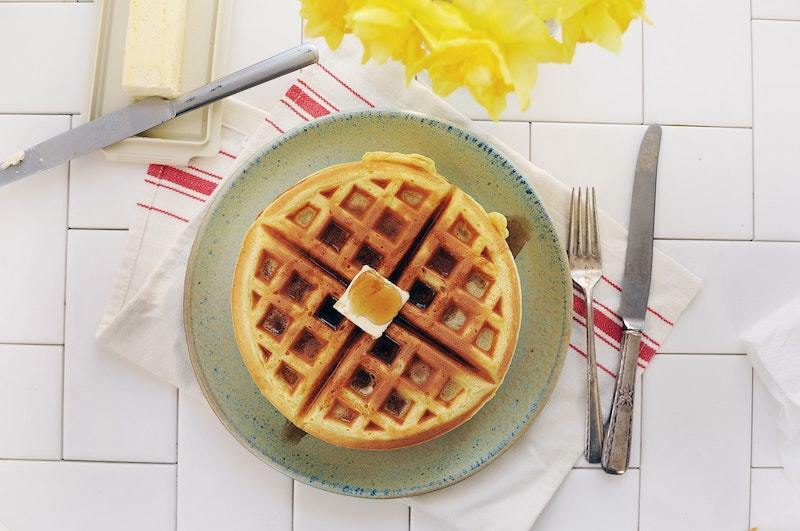 Butter makes the waffle taste so much better, but what about health? While non-stick coating is great for convenience and easiness of cleaning, does it add some unwanted and potentially dangerous chemicals to your food? I, personally, would always welcome a few extra calories over the risk of consuming BPA and other dangerous chemicals. But that’s just me. If you go for non-stick always make sure that the coating is safe and sound. That’s another question only you can answer. How many waffles are you planning to cook in the morning? If you’re alone and you can eat just a few there is really no need to get a large machine at all. On the other hand if you have a big, hungry family it might be better to get a bigger iron that can make two or more waffles at once. It’ll save you a lot of time each morning, especially for families larger than four and big, hungry mouths. My hubby eats a ton of waffles each every time I make them so I kinda regret not getting a big one. Heating time is one of those things that is not that important but rather than nice to have. Does it really matter of your waffle maker heats up in two minutes or 10 minutes? Well, not that much, to be honest. But it is nice to a have a fast heating one so whenever you’re craving some delicious Belgian waffles you can whip a few in a few minutes rather then waiting for ages for the iron to heat up and be ready for work. This is one is crucial, at least to me. It is, again IMHO, the most important feature any good waffle maker should have and it is, again – to me, what separates the best from the rest. 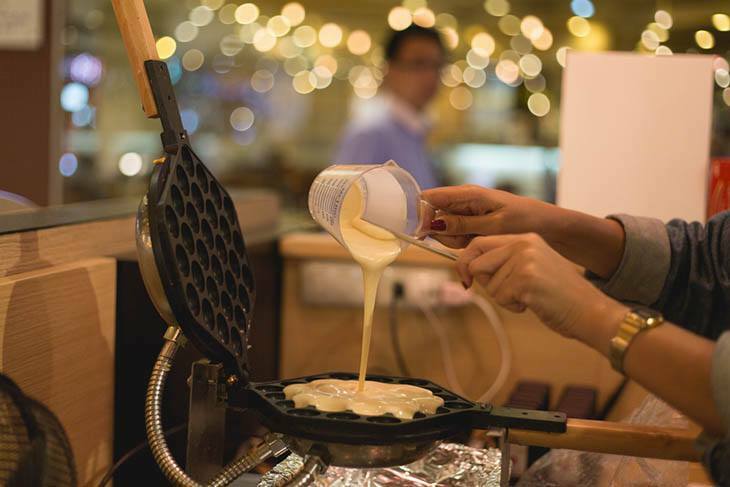 Waffle making is a delicate procedure and consistent temperature and heating is crucial in creating proper Belgian waffles. That’s a bit like temperature control but different. While temperature control manages the exact temperature the iron is operating, browning controls how well your waffles are browned. Some people prefer barely browned pastries while others, like me, prefer a nice golden crust surrounding my goodies. To each their own, I’d say, but still – browning is important, especially if a higher budget model is within reach. I have to tell you – the Warring Pro is NOT for everyone. Yes, you hear me right – it is not one of those one-fit-all devices. For starters, it is rather expensive. I mean it is QUITE EXPENSIVE. Actually, it is out of reach and reason for most households – it might be more of a professional waffle maker rather than one to use at home. But, if you can afford it, it is by far the best one out there. Trust me – I’ve tried them all. Let’s take a look at the power. It features 1400W heating element and it heats up relatively quickly. I timed my waffle making process and it takes exactly 10 minutes from turning on the Warring to biting into the first waffle. While it is not exactly great, it is indeed one of the fastest irons on the list. There are two models of the Warring Pro – a single and double makers. I’d go for the double as it is about the same price as the single but you can cook two waffles at “almost” the same time. You just pour the batter for the first one, flip the handle and pour the second. Easy-peasy delicious Belgian waffles. With the Warring you can even choose the shade of the waffle that you want due – the browning control feature ensures nice and crispy waffles on the outside while keeping the center nice and light without being mushy or undercooked. There are two LED indicators and a nice beeper to alert you when the iron is ready for cooking and when it is done as well. The first LED lights up when the Warring is done heating and ready for operation. Once you start the process you don’t have to watch and wait for the waffle to get done – the second LED indicator and a rather annoying three beeps will alert you when the it is done, even if you’re busy with something else in the kitchen. The only downside of the Warring Pro is its size. Well, there is a bit of a learning curve in getting used to cooking perfect waffles every time, but it is not as bad as the actual size of the Warring. As I mentioned before – it is a not a one-fit-all solution. It is perfect for large houses and big families, but not so much for small apartments and small families or no family at all. It looks a feels more like a commercial waffle maker rather than a home one so keep that in mind as well. You can’t really go wrong with the Warring but keep in mind what I said above – it is a large and expensive for most uses anyway. Say goodbye to messy worktops, which this wonderful iron. There is a reason why the Breville is fighting for a spot here in this list, especially compared to the Warring Pro above. It also has a few advantages over the Warring as well, the main one being the MUCH LOWER price, of course. The Breville has a wide moat all the way around the iron so it catches any extra batter instead of spilling it all over the counter. Said batter is also cooked creating extra small bites to nibble on while cooking – probably the coolest feature ever and, of course, by far my favorite one. It has 7 settings for darkness and browning. On the front of the unit the Breville has a power button and a ready LED light when it is at full temperature. It has a non stick surface which is PFOA free. For safety it has a locking mechanism when the lid is shut to prevent accidents while the waffles are cooking. It comes with thermal pro heating technology, this means that all the plates are heated evenly, so your food is cooking evenly. When your waffle is ready regardless of the setting you won’t have to worry about parts being undercooked. The surface is made of dye cast aluminium plates, but are free from PFOA chemicals, because it is non stick this makes it very easy to clean with a damp cloth. 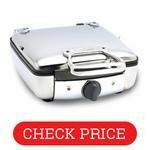 It has an easy grab handle to safely lift and close the lid avoiding burns during cooking time. The maker takes roughly one and a half cups of batter to make the waffles, the maker comes in a silver finish. I might be a bit biased towards the Cuisinart waffle maker and maybe a bit towards the brand as well. This is what I have at home too and while I do LOVE the Warring maker, I prefer the Cusinart for home use. It is a bit more compact and a bit more user friendly to the whole family(*cough* husband *cough*). Truly as it says in its title, some claim they produce the perfect waffle. But for a perfect Belgain waffle you need a perfect iron depth too. With the Cuisinart you are able to create two deep 1 inch Belgian waffles at the same time and they come out perfect every time too! It has a six setting darkness control to create the perfect surface browning. The plates are non stick and free of harmful chemicals as well. Waffles are REALLY easy to remove once cooked – they just fall off the iron plates. There are two LED lights which notify you when the waffles are done. It is simply a case of pour the batter close the lit, flip it over pour again and close – done. It really can’t be more simple than that. The Cuisinart will do all the rest for you while you prepare the toppings and filings for the delicious waffles that are about to come out. The rotary flip is easy to handle and ensures even baking throughout. Two waffles at once a no brainer for the Cuisinart WAF-20. You can see the full review here as well as it is by far ma favorite unit on this list. The diameter of the waffles it makes is six and three quarter inches. Ideal for two people and a tasty snack. Overall, the Cusinart WAF-20 is in really close for the first place and if it wasn’t for the Warring it would be easier the crowned champion. It is relatively cheap for what it is, it can handle large quantities of waffles and it seems a fairly reliable unit overall. I’ve been using mine regularly for a few years and I have no complains so far. Highly recommended!!! Looking like something that has come straight out of a retro episode of Star Trek, the All-Clad stainless steel waffle maker is a great choice for a more retro decorated kitchen. Also, it is the only model so far capable or producing perfectly square Belgian waffles without any trouble at all. While it is a pretty heavy an bulky unit, it has all the bells and whistles to compare with the rest of the irons on this list. It has a superb chemical-free non-stick coating and drip tray for easy release. The All-Clad waffle maker has 7 settings for browning control and the waffles it produces have some of the deepest pockets of them all for for nice and thick toppings build up. The All-Clad 99010GT has also a steam release mechanism which helps the waffles dry as they cook – offering golden crispness on the outside and soft and fluffy core on the inside without any mush or goo. The two LED lights guide you when the cooker is ready for the batter and when the waffle are done cooking. The green LED light has two functions – one to notify when the iron is ready for cooking and the other to let you know when the waffle is done – nice and golden, perfectly crisp without any gooeyness. The casing of the All-Clad is made of stainless steel so is very easy to keep clean, and lock away. However, the model is quite heave and a bit difficult to lift and store away. Probably that’s the only downside of the unit, to be honest, at least I couldn’t find any more for the full week of testing and cooking with it. It is probably best for large kitchens with lots of counter space – the All-Clad is probably best left stationary in your kitchen. Overall the All-Clad is a decent waffle maker but it did feel inferior to the Cuisinart and the Warring, to be honest. Probably on par with the Breville iron we have above, but I’d still choose the Cuisinart or the Breville over the All-Clad. But that’s me! The Cuisinart WAF-300 is the little brother of my beloved WAF-20. The main differences between the two are that the 300 is square and it can make only one set of waffles in one go while the WAF-20 is round and can make double the amount of waffles in one go. The 300 is smaller and less powerful as well. The one thing that the 300 model has over the 20 is that it can make pancakes as well – the irons are interchangeable on the WAF-300. Due to the set of four-slice waffle plates it can serve for making exceptional Belgian waffles but also delicious pancakes. The Cusinart unit has six different temperatures setting on the switch upfront but no browning controls, unfortunately. That’s the other difference from the bigger WAF-20 unit. As I mentioned before, the plates are interchangeable depending whether you’re going for pancakes or waffles. They are both dishwasher safe but you can’t use any abrasive cleaners or brushes on them as you will damage the non-stick coating. I did notice that my dishwasher sorta scratched up a bit the test unit I had so I’d be wary of the dishwasher if I was you. The casing of the waffle maker is made of stainless steel, just like the All-Clad unit above – I’d say they’re pretty close competitors in every way possible. The WAF 300 has pretty much the same features as the All-Clad, including the all-done lights and the beepin signal. I placed the All-Clad unit higher on the list as it seems to heat up a bit faster, but the Cuisinart unit has removable and interchangable irons which are easier to clean. Overall, the WAF-300 is a competent waffle iron that produces great results, it is reasonably priced and an great alternative to both the All-Clad and the bigger, more expensive WAF-20. I’ll let YOU decide which one you’d prefer. 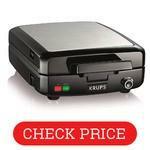 With a price light on most wallets, the Krups iron has 5 temperature settings for browning. The size is very small and compact and it doesn’t waste any counter space at all. You can easily lock it together and store away in a cabinet or a cupboard – it is very thing once folded. The KRUPS plates are non stick and harmful chemicals free, just like the rest of the waffle makers on the list. Even better you – can remove them for even easier cleaning. Just make sure to use a damp cloth and a non-abrasive cleaner. The non-stick coating coul dbe better as I managed to scratch up my test unit pretty bad only a few days in. You can also put them in the dishwasher, but as always the case – don’t overdo it. While easy and convenient, it might damage the non-stick coating in the long run. The KRUPS waffle iron has, just like the rest, two warning lights in the front and a browning/temperature control knob. The red light will let you know when the unit is on and warming up while the green one will illuminate when the iron is ready for cooking and when the waffle is ready to eat. A beep goes along with the light so you don’t have to stand close to it and wait if you have some other chorse in the kitchen to do. Quite convenient. It has a neat little cord tidy and you can store it vertically and save some space, especially if you don’t have the biggest kitchen in the world. Overall, the Krups is a decent waffle iron but you can feel the corner cut with this unit. Don’t get me wrong – the waffles I got out of it were decent, but not really as nice as the Cuisinart and the Breville/Warring units that occupy the first places in their respective categories. It has a plastic casing and the build quality leaves some to be desired. Not much, but some nevertheless. It is reasonably priced, but with all the plastic use you can’t help but think that it should be cheaper than what it is, really. Here we go with another reasonable priced waffle iron that I had the pleasure to test and reviews. While the reviews on Amazon are overwhelmingly postive, I’m still not quite convinced it deserves its place on this list. I have a very mixed feelings with the Presto so let’s start with the positive stuff. The Presto FlipSide is has a bit of a unique flipping mechanism – it feels a bit off-balance but works fine. Prettu much you have to flip the entire unit to 180 degrees when cooking. It’s not heavy or anything so it is easy enough to do, but it feels a bit awkward. The Presto controls feel awkward as well. Instead on the front of the unit, the controls are on the side of the unit so you can’t really monitor the lights. The thing that surprised me the most is that the timer is battery operated. It is one of those Chinese watches you find in a dollar store and it really has no place on a waffle iron of any make. The waffles that I managed to get out of it were OK. Nothing special, like the Warring or the Cuisinart irons, but edible nevertheless. There was no goo or uncooked parts in the middle so there were as good as any on this reviews list. The one major downside that I experienced and I’ve seen it mentioned in other reviews and on Amazon as well is that the non-stick coating is not ideal. Not dangerous or anything, but not really a non-stick either. Most of the waffles I cooked just wouldn’t let go off the iron and stick around. I tried butter (yummy!!! ), sprays, vegetable oil but the results were always the same – sticky waffles. More often than not they will break apart as you’re trying to get them off and prepare for the next one too. It might be me, but I never had such issues with the Cuisinart and the Warring. Overall, the Presto FlipSide is a decent waffle maker but one I can’t really wholeheartedly recommend. While the cooking results were decent overall, the build and the controls leave much to be desired. The price, in my opinion, is a little bit too high for what the Presto is. It is a budget unit with a budget build that shouldn’t really cost more than twenty bucks. Not a penny more. The Dash No Mess does exactly what it promises on the box – no mess Belgian waffle cooking. 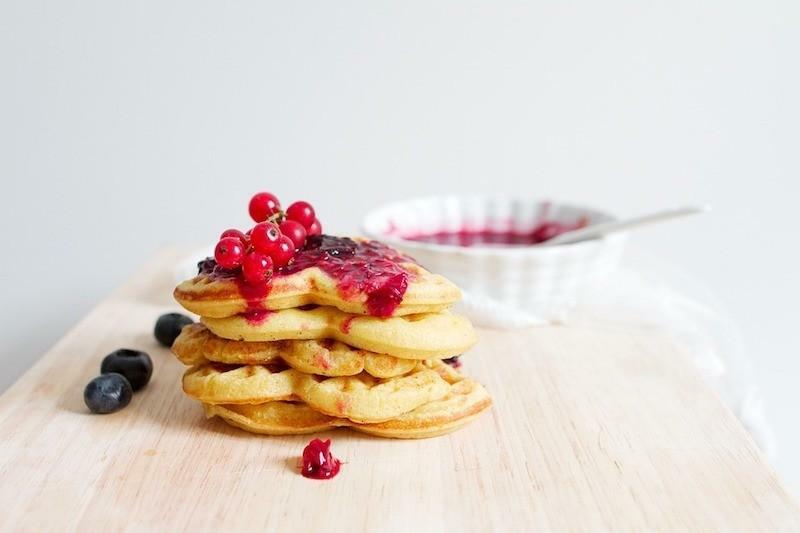 It is designed to catch any overspill from your batter so any excess turns into delicious waffle bites during cooking. How cool is that? There are no fancy settings or browning controls on the Dash unit – it is not a complicated waffle iron at all! Keeping the very low price in mind you really get what you pay here. The Dash waffle maker does not have various settings and controls but don’t let that put you off. You’re not limited to waffles with this unit. You can make panini’s, hash browns, sweet potato waffles and much more. There is a pretty extensive recipe book included in the box with gave me some pretty cool ideas on how to use the iron. It has a non stick coating, which is PFOA free so no worries about harmful chemicals leaking into your food while cooking. The non-stick coating seems pretty decent as I didn’t manage to scratch it while washing it a few times during the week of testing. I didn’t have any sticky waffles like the Presto FlipSide experience so I’d say it is pretty decent. The Dash is really easy to clean as well – all you need to do is rub it down with a damp cloth and you’re good to go! Probably the best option is the no-spilling channels on the irons that prevent any messy countertops in the morning. Overall, the DASH is one of those waffle makers that trully fits the saying – you get what you pay for. 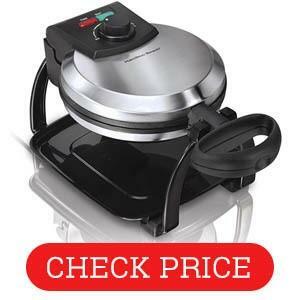 It is arelatively cheap unit – probably the best of the cheap waffle irons on the market. The casing is plastic so it is not ideal and while the non-stick coating is PFOA free, I’m not quite sure how much of that heated plastic is safe for your food to be around. The waffles that it cooks are decent overall, but I have some goo in the middle in the beginning. The overspill protection is nice, but not as nice as say spreading some paper on the counter and just bin it afterwards. There are no controls, timers or warning lights – it is all manual and guesswork. Me, personally, I’d pay a bit more for a proper iron. 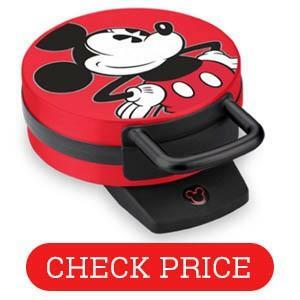 The Mickey Mouse waffle maker is the ideal fun companion to your kitchen, especially if there are any small kids around. Who doesn’t love Mickey or Minnie mouse? There a few models of this iron on Amazon so you can choose between having waffles made into cartoon faces for the kids in the house. It is not really a complicated waffle maker that one – it is as basic basic waffle iron as there is one. Just like the DASH above it got nothing going for it except for the cool Mickey Mouse factor. It doesn’t have any timers or controls whatsoever. Yes, it does have a single Mickey Mouse shaped light up front but it doesn’t notofy you when the waffles are cooked or ready, it is a simple indicator whether the unit is on and heating. I also think that it takes a while to heat up and get ready for cooking. I didn’t have a chance to time it properly, but it took significant time compared to the Dash No Mess above. The overall cooked waffle quality is decent, especially considering the unusual shape of the cooked product. The come out crispy and nicely browned, but don’t expect miracles. You have to have your batter perfect. If it’s too runny it won’t cook properly, if it’s too thick it might get gooey in the middle. If you get it right you’ll get decent cartoon faces waffles. The build quality is nothing to write home about either. As I mentioned above, the Mickey/Minnie Mouse shaped waffles that come out are pretty much the only reason to consider this iron. It is finnicky and mine just never sat right while cooking – it always felt tilted on a side a bit. It feels underpowered as well – the iron heating element is only 800W. Compared to the rest of the irons on this list it does feel underpowered and slow to start as well. Overall it is a cheap unit. Should be much cheaper than it is, to be honest. While the waffles are decent and fun with the cartoon feel, I really don’t think all the plastic and underpowered heater should cost the price they cost. Of course, that my own opinion, but I wasn’t impressed to say the least. 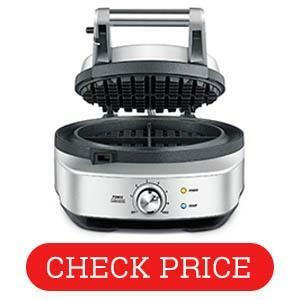 The Hamilton Beach Flip is a breath of fresh air amongst the budget range of Belgian waffle makers on this review list. Last on the list but definitely not the least of them all. The Flip has a lot more in common with the likes of Cuisinart and All-Clad reviewed above compared to the budget alternatives of Dash and Presto, especially the latter. 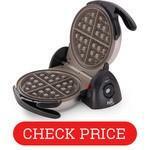 It has all the bells and whistles of a proper waffle iron without the price tag of the Warring, for example. The casing is stainless steel so it automatically makes it a better contender than the Dash and the Presto. It has browning and temperature controls which is very useful if you’re experimenting with recipes and batter consistency. The Flip mechanism is very good, although you can only cook a single waffle with the Hamilton Beach at a time – there is no double waffle cooking option. There are two lights on top of the unit – one to indicate there is power on and another lights up when the temperature is right for cooking. There are no audible signals so you have to stick around and wait for the waffle maker to heat up, unlike the top irons reviewed above. The non-stick coating seems nice and tight, but I didn’t see any indication whether it is PFOA free or not, which is a bit worrisome. For the price it should be PFOA free and it might even be, but it is not specifically mentioned anywhere. Cleaning the non-stick plates is a breeze – all you have to do is wipe them with a damp cloth after cooking and you’re good to go. I personally didn’t have any issues with waffles sticking or anything like that so all is good. 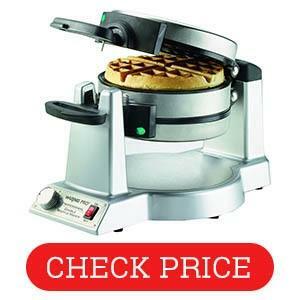 The one downside of the Hamilton Beach Flip waffle iron is the time it takes to cook a single waffle. I didn’t time it properly, unfortunately, and I already returned the test sample, but I’m pretty sure it was well over five minutes, maybe close to six. That’s totally fine if you’re cooking for yourself and planning to eat a Belgian waffle or two, but if you have to cook for a family of four, for example, it can take the most of your morning to prepare breakfast. It gets annoying pretty quick, to be honest. Overall, the Hamilton Beach is a decent unit but there is nothing special about it, to be honest. It is well put together, reliable and easy to clean, but it just takes too much time to cook and for the price is sells, usually around fifty bucks, there are better options. Up a few and you’re going into Cuisinart category, which the Hamilton Beach is no mach for. Are Waffle Makers Any Good? Yes, they are, especially the good one. Yes, I know, but here, as most areas in life, you get exactly what you pay with a few exceptions. While the best iron on this list, the Warring Double, is being discontinued, it is still widely available for purchase. I’d say get it while you still can. Most of the budget ones can be a big hit or miss, so read carefully what you buy and how to use it. 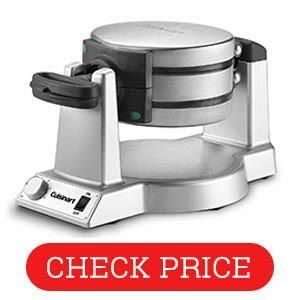 You can cook perfect waffles with a cheap unit as well, but the speed and consistency will cary significantly so yes – they are good if you get a good one. Get a bad one and you’ll hate waffle making forever. What is The Best Temperature for Belgian Waffle? 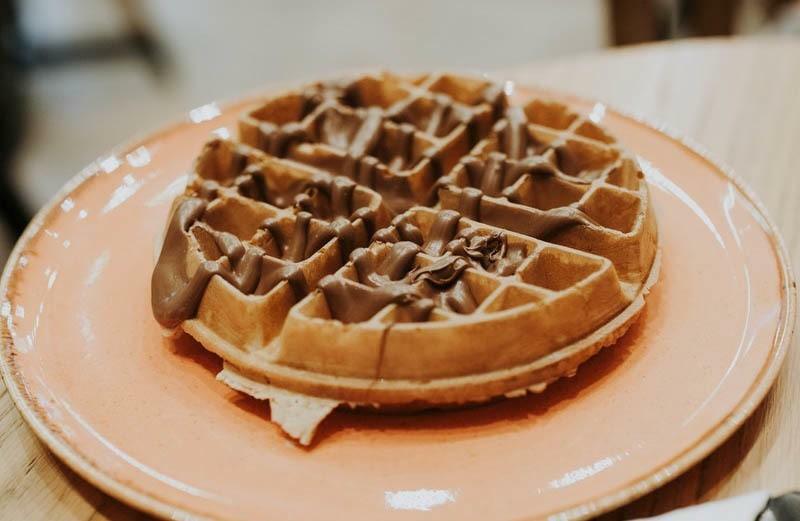 The ideal cooking temperature for a perfect Belgian waffle is 360° F or around 180° C.
Anything higher than 360° F will caramelize the sugar in the batter way too quickly, causing it to burn before the waffle is cooked in the middle. At 360° F it still caramelizes and gets that nice golden color, but the temperature allows enough time for the waffle to be perfectly cooked. Anything lower than 355° F will cook the middle if you give it enough time, but it will not brown the waffle properly and it might be gooey on the inside. Also, if you’re using yeast in the recipe, the waffle might turn spongy and not fluff properly. Yeast based recipes need hot plates to raise the batter quickly without burning – 355-360° F is just about perfect for that. What’s the difference between Belgian waffles and regular ones? 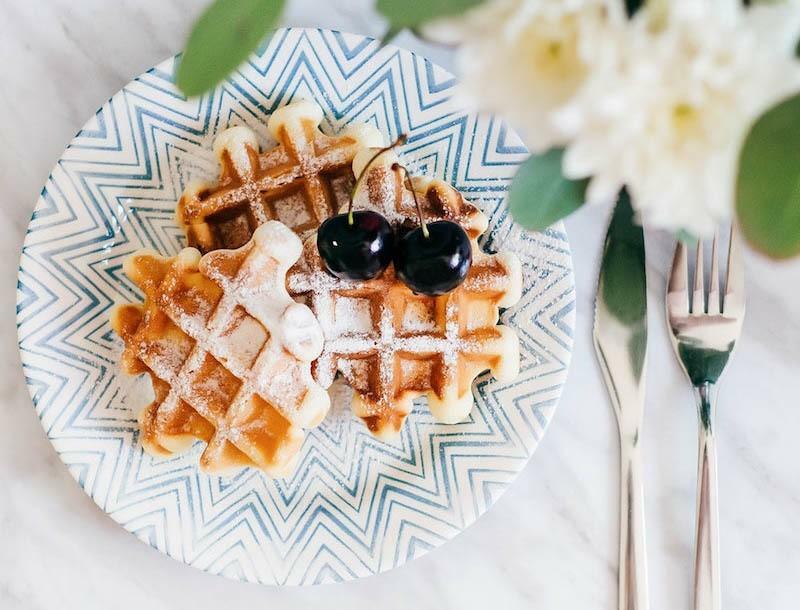 While in general they’re both waffles and follow somewhat simple recipe, but Belgian waffles are quite different from regular American waffles. Belgian waffles are lighter and crisper than regular ones. Also, they have much deeper pockets which can hold much more toppings, syrup and Nutella than regular ones. To make Belgian waffles you need a waffle iron with deeper pockets and longer “teeth” pattern. Also, Belgian waffles pockets are larger than regular ones so your iron should have more space between the plates. Also, most Belgian waffles batter recipes include yeast and you have to weight for it to rise. 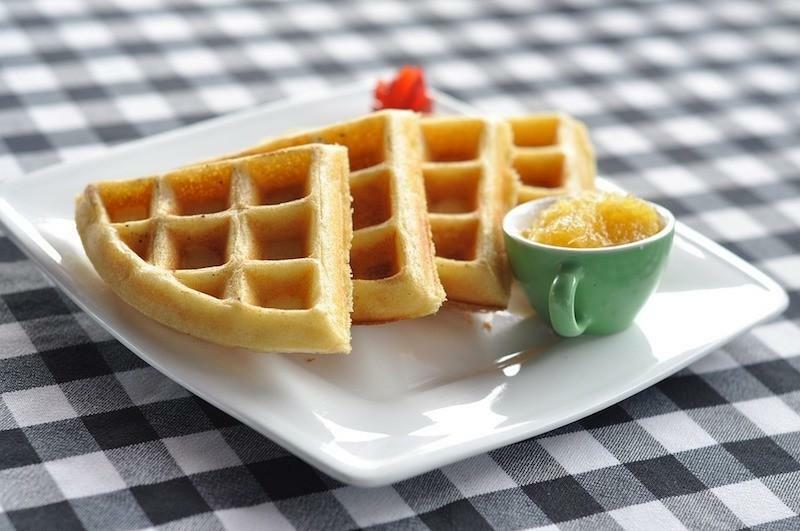 American waffle recipes are often based on buttermilk and tase quite different too. Are flip waffle makers better? To answer the question short – not necessarily. Actually, during this testing, I’ve found no definitete proof or any significant different between the flip and non-flip models I tested for this review. I think it all comes to the overall quality of the iron rather than a gimmick like a flip or non-flip. Yes, the Warring that I chose as the best pick overall is a flip model, but I really think that has more to do with the double size of the unit rather than actualy necessitiy of flipping. For example, the bes Belgian waffle maker – the All-Clad iron – is non-flip but the results I got our of it were fantastic to say the least. So in short – no, flip waffle makers are NOT better – they are just different. 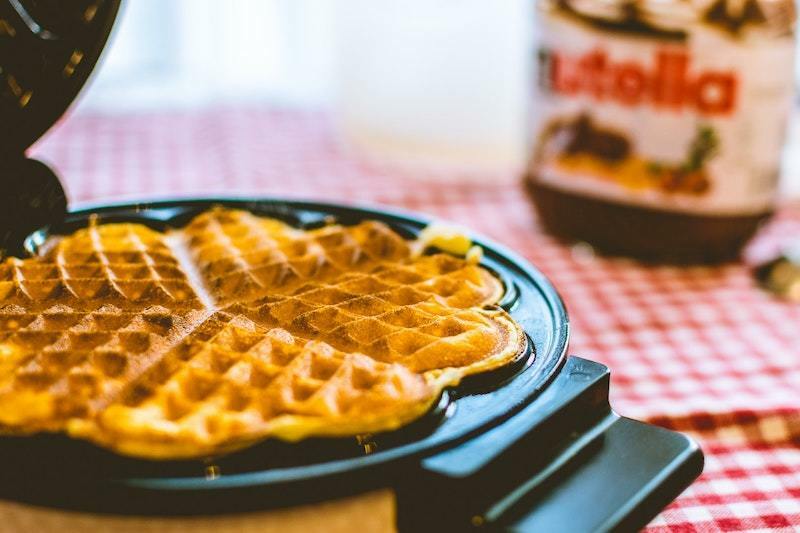 What Are The Most Common Types Of Waffle Makers? Stove top waffle irons are old school. It is pretty basic construction that you can take outdoors and to camping trips as well. you can cook waffles over an open fire and still get great results – just make sure to preheat it first. Most often than not they work better for gas stoves rather than electric or induction, but they are hard to use – there is no temperature control or consistency with them – it is all a guessing game. Great for the outdoors, but I really don’t think they have a place in a modern home. As I mentioned above, the Belgian waffle makers have much deeper and larger grid pattern so the waffle pockets are large and deep – great for storing good amounts of butter, maple syrup, Nutella, whipped cream or whatever else floats your boat, really! The classic round waffle maker – what’s not to like? It is usually not as good as a Belgian one, but it is usually much cheaper and cooks just as good waffles as Belgian ones, especially if you use pre-made batter or off the shelf mix. While more of a gimmick rather then a useful feature, flip waffle makers are slowly gaining popularity. Yes, there are few bad eggs *cough* Presto *cough*, but overall there some decent flip irons on this list, including the chosen best – the almighty Warring Double Pro. How To Cook Crispy Waffles? While it looks like an easy question to answer, it really isn’t. You need a good recipe, good waffle iron and correct cooking temperature to get proper crispy waffles. It comes down to temperature, mix and cooking time and the correct temperature is by far the most important one. 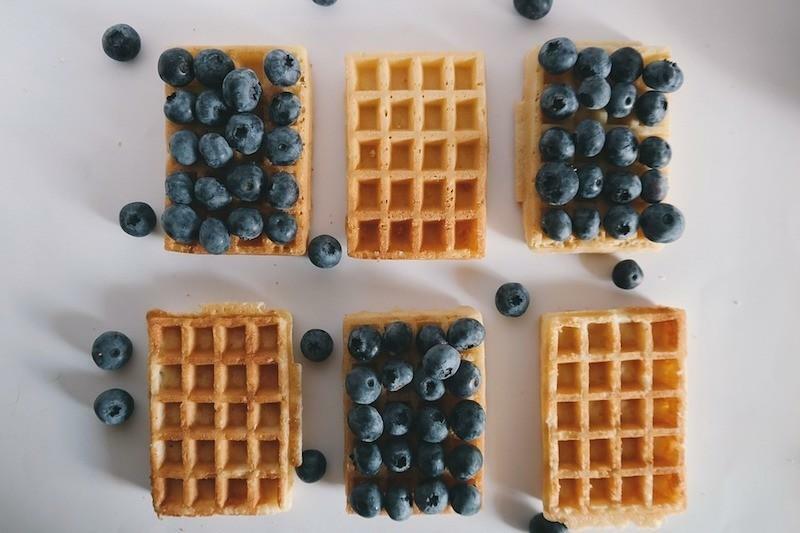 What is The Best Belgian Waffle Recipe? How Much Batter To Use When Cooking Waffles? That’s probably the most common questions I came across in my research. There is no definite answer to that and it hugely depends on the waffle maker you’re planning to use. Most recipes calls for a cup to a cup and a half of batter, but that’s if you have a regularly sized waffle maker. For smaller units you’ll have to consult the owner’s manual and see the recommended amount of batter to use. If you use too much it will overflow the iron and probably make a huge mess in the kitchen. If you skimmed through the article and you landed straight here, like most people do anyway, let me summarize my findings and conclusion with you. Basically, if you want the best of the best, have the storage space for it and you have the means to afford it, you really can’t go with the Warring Pro waffle maker. It is just in a class of its own. It might actually be better suited for a small waffle shop, but it is a very high quality iron that cooks waffles quick, efficient and very, very consistent. Ideal for large families and big households. If you want the best Belgian waffle maker that is doesn’t cost an arm and a leg – the All-Clad is the obvious choice. It doesn’t flip, but it has all the bells and whistles of a proper waffle iron. It is a bit expensive so if money are tight, check out the next on on the list. The Cuisinart WAF-20 is the one I bought at home. Although a bought it a few years before this review, I am still convinced it is the most sensible choice for most households. It is VERY reasonably priced for the quality and the consistency of cooking you get our of it. It is well under hundred dollars in most stores and it comes with a proven track record, great warranty and after care. The rest on the list are about average at best, except for the Presto – I really didn’t like that one for lots of reasons. Probably the best cheap waffle iron is the KRUPS model, but all the rest are worth considering as well. The Hamilton Beach is a bit of a different beast – it feels and looks like a proper machine but id doesn’t quite cut it compared toe the Cuisinart, which is only a few dollars more. Those few dollars are much better spent for the much better unit, in my opinion. 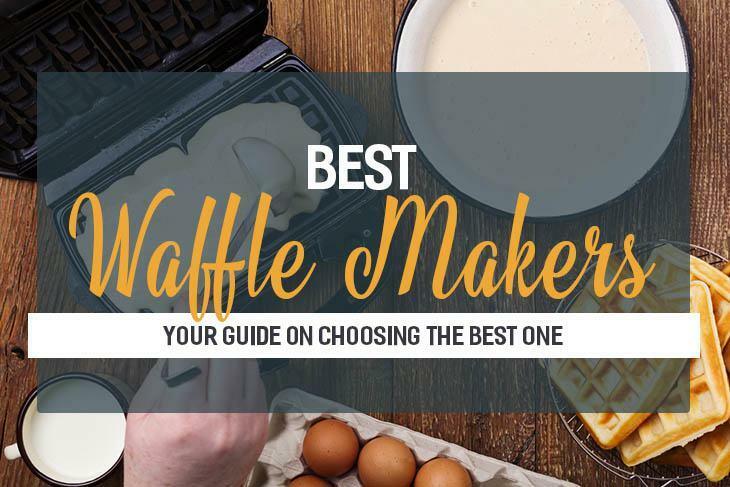 I really hope that this review list helps you choose your next waffle maker and if you have any questions or concerns please don’t hesitate to drop me line in the comments below. Looking forward to hearing from you!